Confidence in Ladbrokes St Leger entry, John Gosden's Shantaram, appears to be growing ahead of the Group 1 contest at Doncaster on September 15th, the recent Newmarket winner having been cut from 12/1 to a top-priced 10/1 in the St Leger Festival betting in recent days, writes Elliot Slater. The Galileo colt had been somewhat frustrating earlier in the term, when running up a sequence of near-misses, but has come into his own of late, and finally seems to be getting the hang of the racing game. Gosden is keen to get further race practice into his good-looking colt, who will head to York later this month to contest the Group 2 Neptune Investment Management Great Voltigeur Stakes, a contest seen as a key trial for the St Leger some three weeks later. 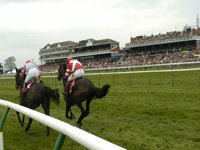 The Newmarket handler has a particularly good record in the world’s oldest classic, having won the race three times in the last five years, 12 months ago sending out Masked Marvel to a famous victory on Town Moor. Punters are clearly aware of Gosden’s record and his upbeat comments following Shantaram’s victory in the Group 3 Bahrain Trophy on the July course, last month, appear to be having an effect when combined with reports that the three-year-old has been pleasing connections in recent work at HQ. The Lady Bamford-owned full-brother to the classy Gan Amhras had been a narrow second on each of his first three outings, including when failing by only three-quarters-of-a-length to lower the colours of the subsequent Investec Derby runner-up Main Sequence in the Lingfield Derby Trial. However, he finally got off the mark at the fourth time of asking when justifying long odds-on in a Newmarket maiden. His subsequent impressive defeat of Naseem Alyasmeen showed that the well-built individual is definitely going the right way at present. Closer to the present; visit the York Ebor betting page for more information on the next meeting on the race calendar. NB You can use betting software to place bets automatically. BF-BotManager is the one I use as it is reliable and is constantly updated to reflect best practice and industry thinking. "Score" column is added to main markets grid, score is determined by using Correct Score market prices. Correct score market must be loaded and monitored during in play for this to work.